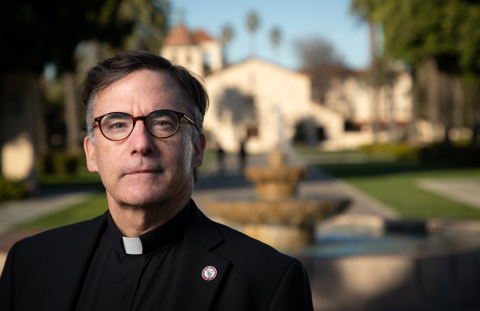 Santa Clara University today announced that Kevin O'Brien, S.J., a theologian, Jesuit priest, and educator, will become the 29th president of Santa Clara University on July 1, 2019. O'Brien, 52, succeeds Michael Engh, S.J., who announced in June 2018 that he will be concluding his presidency at the end of this academic year after 10 transformative years. Since 2016, O'Brien has served as dean of Santa Clara University's Jesuit School of Theology, an international center of scholarly and ministerial formation, with a faculty and student body consisting of lay men and women, Jesuits, clergy, and members of other religious orders. There, he is responsible for overseeing the academic, enrollment, fundraising, and student-life operations of the 85-year-old Catholic theologate, one of two theology centers in the U.S. sponsored by the Jesuits. He previously spent eight years at Georgetown University, the last five as vice president for mission and ministry. In that role, he oversaw the largest inter-faith campus ministry in the country and cultivated the Catholic and Jesuit mission of higher education and Ignatian spirituality among faculty, staff, students, parents, and alumni. While at Georgetown, he also served on the President's Cabinet. As the next President of Santa Clara University, O'Brien brings a deep knowledge of the requirements of higher-education leadership, having spent significant time at both Georgetown and Santa Clara managing diverse operational and academic teams; working to ensure alignment between mission and the day-to-day realities of university management; collaborating with board members, external partners and donors; and working with faculty and staff to champion academic excellence. Moreover, he is a widely recognized Jesuit leader nationally, having served on the boards of three Jesuit universities-Seattle University, Marquette University; and Boston College-and on the faculty of the Jesuit Leadership Seminar, which helps form Jesuit university leaders from around the country. He is a widely sought commentator about the Church in national media and writes in the field of Jesuit higher education and spirituality. O'Brien is also a popular educator, having been chosen by Georgetown students in 2016 to receive the Dorothy Brown Award for Excellence in Teaching. "We are delighted to have chosen Fr. O'Brien from a rich field of Jesuit leaders to guide Santa Clara University as it embarks on a new phase of growth, educational excellence and accessibility, and innovation," said Board of Trustee Chair John M. Sobrato, who co-chaired the search committee, which conducted a deliberate, inclusive and thorough process. "Fr. O'Brien is charismatic, articulate and engaging; natural at building meaningful relationships; and collaborative and transparent-with an inheren grit and decisiveness. These are all qualities that are critical to leading this University." "I am deeply humbled to be asked to take the helm of Santa Clara University and to build upon all that Fr. Engh and his team have accomplished over the last decade," said O'Brien. "During my three years as dean of the Jesuit School of Theology, I have gotten to know well the Santa Clara family: our outstanding faculty, dedicated staff, and talented students. I look forward to working with each to build on the strong foundation laid by the 28 presidents who preceed me, to take Santa Clara University to its next level of national prominence." O'Brien comes to Santa Clara University at a pivotal time, as the Silicon Valley-based private University recently went public with a $1 billion comprehensive fundraising campaign, Innovating with a Mission: The Campaign for Santa Clara University. O'Brien was born in Montreal, Quebec, to an Irish-Catholic family of five, which moved to southern Florida when he was four. His late father, Larry, spent 35 years as personal manager to the legendary golfer Jack Nicklaus-for whom O'Brien's older brother Andrew still works. His late mother Elizabeth worked in the home. His older sister Cathy is a special-education teacher in Denver whose daughter is a first-year student at Santa Clara. He became a naturalized American citizen at age 22, just after graduating from Georgetown in 1988 with a degree in government. He then returned to his home state to attend law school at the University of Florida, serving as an editor on the Florida Law Review. He practiced corporate litigation for two years, after which he had a mini-epiphany-described in his book The Ignatian Adventure-that led him to leave his law practice and begin teaching social studies at Cardinal Newman High School in West Palm Beach, Fla.
After years of discernment, O'Brien joined the Society of Jesus in 1996 and was ordained to the priesthood in 2006. During the course of his 10-year formation as a Jesuit, O'Brien earned a master's degree in philosophy from Fordham University and a Master of Divinity and a Licentiate in Sacred Theology from the Weston Jesuit School of Theology, now part of Boston College. He has taught philosophy and ethics at Saint Joseph's University in Philadelphia and business law at Le Moyne College in Syracuse, NY. Among his pastoral work during his Jesuit formation, O'Brien served as a chaplain for the Jesuit Refugee Service in immigration detention centers in Los Angeles and worked serving migrants on the Arizona-Mexico border. Those experiences have led him to be a frequent commentator on compassion for migrants as central to Catholic social teaching. He also spent time caring for patients in a leprosy hospital in northeast India and ministering in Bolivia, Mexico, and Guatemala. In 2011, O'Brien wrote a book that has sold more than 40,000 copies and been translated into three languages, The Ignatian Adventure, Experiencing the Spiritual Exercises of Saint Ignatius in Daily Life. The book presents for modern day life the 500-year-old tradition of Ignatian spirituality. The book was honored by the Association of Catholic Publishers Excellence in Publishing Awards in 2012, and received 4.42 stars out of 5 on Goodreads. O'Brien also is a regular and thoughtful writer on the intersection of theology and contemporary society. He was a commentator about the Church on MSNBC from 2013 to 2015, and appeared in a video on the news site mic.com, gently debunking the notion of a "war on Christmas." That video was the most-viewed video on the site in 2017, with more than 10 million views. He has written articles and participated in panels advocating for authentic and lasting reform of the Catholic Church amid the recent sexual abuse scandals. In 2018 he wrote a widely read opinion article on CNN.com, lamenting clericalism in the Catholic Church and its role in enabling the scandals. He noted that he took hope in the knowledge that, in good times and bad, "the church is a people on a journey to make God's dream for the world a reality." Founded in 1851, Santa Clara University sits in the heart of Silicon Valley-the world's most innovative and entrepreneurial region. The University's stunningly landscaped 106-acre campus is home to the historic Mission Santa Clara de Asís. Ranked the No. 1 regional university in the West by U.S. News & World Report, SCU has among the best four-year graduation rates in the nation and is rated by PayScale in the top 1 percent of universities with the highest-paid graduates. SCU has produced elite levels of Fulbright Scholars as well as four Rhodes Scholars. With undergraduate programs in arts and sciences, business, and engineering, and graduate programs in six disciplines, the curriculum blends high-tech innovation with social consciousness grounded in the tradition of Jesuit, Catholic education. For more information see www.scu.edu.